Our 2018 show, Momentum, features new work by returning artists Carol Hughes, Kim Johnston, Jean Loney, Leslie Miles, Gail Root and Susan Strachan Johnson, and by two new members of the group: Judy French and Anne Smith. 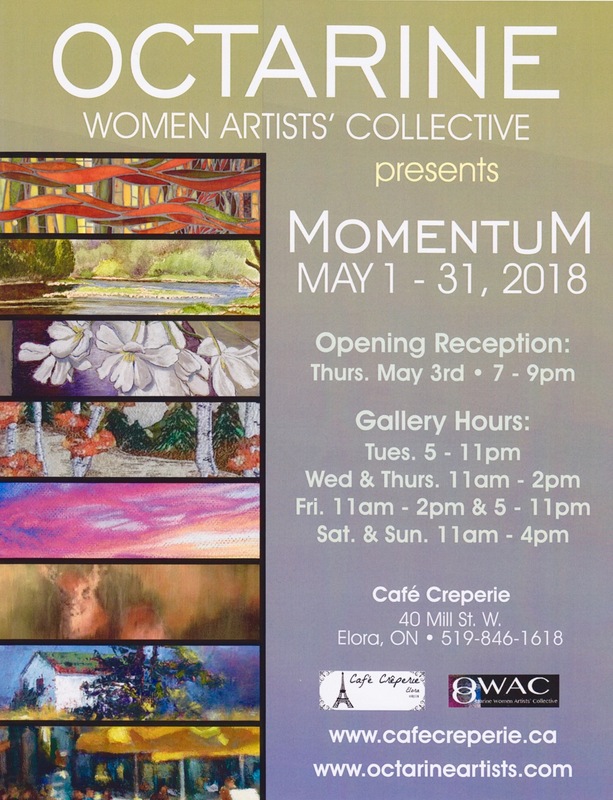 The exhibition takes place from May 1 – 31, 2018 at Cafe Creperie, 40 Mill St. West in Elora, Ontario. Hours are Tues. 5 – 11 pm; Wed. & Thurs. 11 am – 2 pm; Fri. 11 am – 2 pm and 5 – 11 pm; and Sat. & Sun. 11 am – 4 pm. Opening reception is Thursday, May 3 from 7:00 – 9:00 pm, open to the public. This year’s show, A Land for all Seasons, is a collection of celebratory images of Canada. The styles range from realism to abstraction, and reflect the different ways each artist honours the peace, the openness, and the freedoms of this country. The exhibition takes place from February 5 to March 5, 2017 at the Homer Watson House and Gallery in Kitchener, Ontario. Gallery hours are Tuesday – Sunday, 12:00 – 4:30 pm. Opening reception for the show is Sunday, February 5 from 2:00 – 4:00 pm. There will also be a meet the artist event on Saturday, February 18 from 1:00 – 3:00 pm. 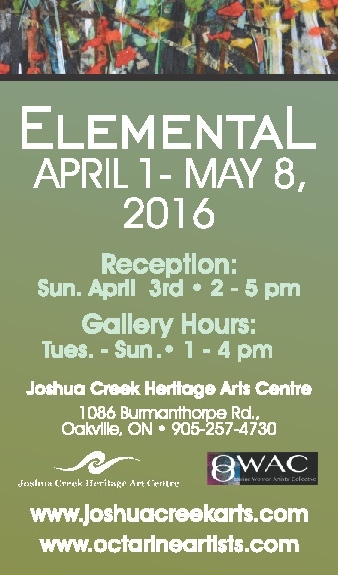 The beautiful Joshua Creek Heritage Art Centre is the setting for the 2016 Octarine Women Artists’ Collective exhibition, titled “Elemental”. The show will take place in Joshua Creek’s gallery, a beautiful, airy renovated barn. Gallery hours are Tuesday to Sunday, 1:00 – 4:00 pm. Opening reception for the show, with artists present, is Sunday, April 3, 2016 from 2:00 – 5:00 pm. 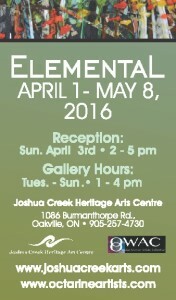 Joshua Creek Heritage Art Centre is located at 1086 Burnamthorpe Road, Oakville, Ontario (just east of Trafalgar Road). Telephone: 905-257-4730. After the success of our first show in 2014, the Octarine Women Artists’ Collective is busy making plans for our second annual show, titled Encore. The dates for 2015 are: May 1 – May 10. The venue remains the same as last year, Studio 404 at 404 York Road in Guelph, Ontario. Here is a little more information about us and about how this show came about. 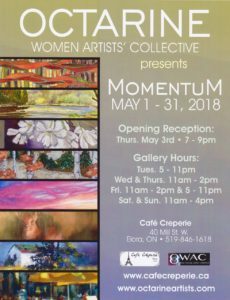 The Octarine Women Artists’ Collective is a group of eight artists who have come together to exhibit our art. Our inaugural show will last only three days only, and there will be some hot ticket items! So people are encouraged to come early. The name Octarine is taken from an imaginary colour which is supposedly the eighth colour in the spectrum, seen only by wizards and people of extraordinary perception. It is used by the group as a metaphor for what is beyond the obvious, as we strive to say more in our art than merely depict the world around us. As seasoned artists, we each create in different mediums and move in diverging directions. As we exhibit together and familiarize ourselves with each other’s art, however, we are inevitably influenced by it. Thus our use of octarine is more than just a colour metaphor; it is like an eight-faceted crystal, absorbing and refracting light in new and original ways. The Eight Dimensions of the title is for our eight different views of the world. As mature women, we have many shared perspectives, with common influences and experiences; yet we have also each established a path of we own. For the last six months, we have been exploring new directions. Come and check out where we are going!